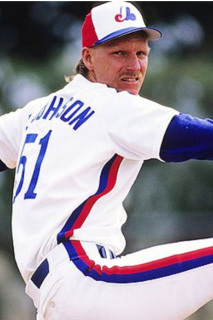 Nicknamed "The Big Unit", Johnson was one of the most feared pitchers in baseball history. The 6‐foot‐10‐inch left hander was celebrated for having one of the most dominant fastballs in the game. He began his professional career with the Jamestown Expos of the New York‐Penn League during the 1985 season, starting 8 games and striking out 21 batters. In 22 MLB seasons Johnson would amass 303 victories. His 4,875 strikeouts are the most all‐time by a left‐handed pitcher and second overall behind only Nolan Ryan. He was named to 10 all‐star teams and won 5 Cy Young Awards. In 2001, he became a World Series champion with the Arizona Diamondbacks and was named World Series MVP.